Alok Sarkar (b 1933) is a celebrated Indian poet from the 1950's generation. He commands a solid and significant body of work written over nearly half-a-century which includes more than a dozen collections of poetry, several volumes of poetry-prose, an autobiography etc. Poetry Fortnightly Press (Kabita Pakkhik), Kolkata, has published his collected poems in four volumes. 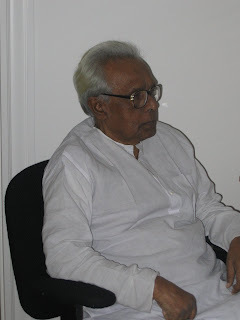 Alok Sarkar has received several poetry awards during an illustrious literary career the most noteworthy of which is the Tagore Award (Rabindra Purashkar) for literature - the highest state award in Bengali literature - which he relinquished this year in protest against the neo-liberal Marxist state government of West Bengal, for launching genocides against poor peasants unwilling to surrender their farmlands to a government-sponsored spree of rapid and mandatory industrialization. Alok Sarkar's poetry is founded on cultural and linguistic traditions that are deeply vernacular. Rather ascetic is nature, Alok Sarkar's poetry is made with words and images that are carefully weighed and optimized. Absence is a key element of his poetry. Many of his images are mirrored thru the void. A color scheme is often expressed via a complete absence of colors. Meaning is anointed with meaninglessness. Subjectivity is either reversed or pushed out of focus to the periphery. As the pronouncement of existence gets sharper in his poetry, Alok tends to follow more avidly the "non-existence of existence". Nought always occupies a special place in his poetry. The occupancy of space by nought is one of the most imperative constituents of his entire thought-process. Nought, too, signifies existence. It is the presence of nought that complements the existence of nothingness. The poet is currently in Boston, visiting his son. He plans to return to India early January, 08. Alokda is one of my favourite poet whose poems are entirely different in nature and form. Kudos to Kaurab for projecting such a brilliant presentation on Alokda's poems. I have every faith on Aryanil, and I am sure he will definitely cover other legends of Bengali poetry as well. Nice work. Alok's poems to show bengali cultural immage, it is very much important, i think.